India has more absolutely poor people than the 20 poorest countries of Africa. It has the highest number of malnourished people at 230 million in the world. Those who have grown up amidst famines and shortages will find it hard to accept any wastage of resources. Last week’s fire in the Maharashtra Secretariat in Mumbai attracted national attention largely because – apart from the loss of lives and damage to property – there was a heightened concern that even a Chief Minister’s office is not safe. IN 1985 under the stress of paddy glut in Punjab markets and the Central government dragging its feet due to bulging food stocks with them, the Punjab government set up an expert committee for suggesting measures that would resolve the problems of market clearance for the rice crop in the state. The committee after extensive consultations with professionals in the related fields, informed farmers and other stake-holders submitted its report well in time before the paddy plantation season in 1986. Times have changed and so has the value system of our nation. From being a mission, the education sector has become a thriving area of business. Medical education is no exception. In fact, it is getting highly commercialised with each passing day. Privatisation and corporatisation are the new buzz-words today. Irrespective of how the coming security transition in Afghanistan pans out, one country is on a surprising course to a major strategic defeat: Pakistan. Every foreseeable ending to the Afghan war today portends nothing but serious perils for Islamabad. EVER since the Soviet invasion of Afghanistan, Pakistan has had one simple strategic goal on its western frontier: ensuring that Afghanistan remains a stable but subordinate entity deferential to Pakistan’s sensitivities on all matters of national security. Such deference was sought for a host of reasons. Islamabad wanted a guarantee that Kabul would not reignite the dispute over the countries’ common border (the Durand Line) and would not seek to mobilize the region’s Pashtun populations in support of either absorption into Afghanistan or the creation of a new nation. At the rhetorical level, Washington and Islamabad say they want the same outcome in Afghanistan, but at the operational level, the two sides are backing very different horses. Negotiations between the US and Pakistan over the cost of hauling freight from Karachi port to Afghanistan and the wording of a statement of regret or apology over Pakistani deaths at a border clash last November have become demeaning to everyone involved. Patching up these contentious issues will have lasting benefit only if a much larger impasse can somehow be bridged. The central impasse currently afflicting bilateral relations is over a future composition of an Afghan government. India has more absolutely poor people than the 20 poorest countries of Africa. It has the highest number of malnourished people at 230 million in the world. Those who have grown up amidst famines and shortages will find it hard to accept any wastage of resources. The believers in the philosophy of Mahatma Gandhi cannot stand ruling politicians and bureaucrats making needless foreign trips, holding official conferences in five-star hotels, flying in helicopters or being driven around in swanky cars. In this country the display of wealth or holding of lavish social ceremonies is frowned upon by members of the aging generation who have led modest lives with small incomes and limited resources. Post-reforms, as India’s growth rate shot up, corporate salaries skyrocketed, scandals involving astronomical amounts surfaced, real estate boomed and black money spread all over, the country was caught in the grip of consumerism. India Inc is growing because urban Indian consumers are spending more on houses, cars, SUVs and electronic gadgets. A revolution in IT and telecom has globalised lifestyles and thinking. As low-cost airlines arrived and flights became cheaper, more middle-class Indians flew abroad for holidaying. In this environment, the talk of austerity seems out of place. The other half called Bharat that growth has bypassed is complaining and protesting. The divide between Bharat and “Shining India” is widening with serious social repercussions. If India’s rich are spending, India’s powerful, that is politicians and bureaucrats, cannot lead simple lives on the Gandhian pattern. Governments usually overspend, not just on running an elaborate, extravagant administration, but on providing what for some may be luxuries and for others necessities to ministers and officials. When the tainted Central government talks of austerity or a growing Haryana decides to allow MLAs and IAS officers to fly business class or a heavily indebted Punjab plans to spend Rs 100 crore on buying helicopters, the other half is bound to get upset. Some save and keep money in banks. Others take risks, invest and grow. It is an individual or governmental choice. People even re-elect profligate governments. Last week’s fire in the Maharashtra Secretariat in Mumbai attracted national attention largely because – apart from the loss of lives and damage to property – there was a heightened concern that even a Chief Minister’s office is not safe. TV channels hinted at sabotage and speculated about Adarsh scam files getting destroyed in the fire. Even though such a thing might not have happened, the possibility of saboteurs or mischief-makers setting fire to important government records cannot be entirely ruled out. Three days after Mumbai Mantralaya was gutted, another fire broke out in Delhi’s North Block housing the Union Home Ministry offices. The scale of the fire, fortunately, was limited. Such incidents point to government inefficiency and raise concerns about poor maintenance of high-profile buildings, which require protection not only from terrorist attacks but also from fire hazards. In comparison the Delhi Secretariat was more alert as it discovered, during an inspection, safety norm violations and suspended the fire safety certificate. Smoke sensors were found to be defunct and the main water pipeline was not functioning. The Delhi Fire Brigade, unlike its counterparts elsewhere, is legally empowered to seal unsafe buildings. Government buildings are supposed to undergo fire audits and many do, perhaps. Mumbai Mantralaya had a fire audit in 2008. But shortcomings are not fully addressed, often due to apathy or lack of funds. Fires are common in summer. Yet official preparedness is not adequately geared up. Sometimes fire brigades are found ill-equipped and sometimes narrow urban lanes and the shortage of water delay fire-fighting efforts. It took quite a few days to control a recent fire in a paper mill at Amritsar in which the loss was estimated at Rs 250 crore. Even in a planned city like Chandigarh the Municipal Corporation does not follow fire safety norms. As a nation we are indifferent to life-threatening hazards around us. A fire, an accident or a disaster shakes us for a few days and then all is forgotten. This “chalta hai” attitude must stop. The tongue can tell if that ‘aloo tikki’ is done just right, but not whether the oil it is fried in is up to the mark or if the ‘aloo’ was washed. We, the connoisseurs of street food, have our own hygiene and quality standards, and the vendor his own. Who is to decide what exactly is called ‘good oil’ or how to wash the plate on the street? Well, the Bureau of Indian Standards is coming up with a set of basic requirements for street food vendors, which can be a reference point for whoever wants to assess how safe that ‘tikki’ is. Certification under the norms would be optional, so it is not going to clean up all street food. However, it definitely is a step towards increasing awareness on food safety. Most of us look upon street food as unsafe, but little do we realise what we eat at home is only marginally better. We can do little about the urea or dirty water in our milk, cancer-causing calcium carbide on our bananas, or the black dye in our favourite ‘daal makhni’. In a country as vast, populated and under-regulated as ours, there is rampant adulteration or contamination of food at all stages — production, transport, and retail. Given the high prices — and, therefore, profit margins — those handling food find it easy to overcome any moral pangs. According to the Food Safety and Standards Authority of India (FSSAI) — set up only in 2008 — 13 per cent of all food in the country failed to meet its standards. One of the primary reasons for all this carrying on is little check. There are only about 2,000 food safety officials, where the FSSAI wants 6,000. Banning a substance like calcium carbide only means the trader now has to pay a bribe to use it. What we need is huge investment on post-production food handling and transport technology to clean up the entire chain. The cost would be more than made up in saving the current 40 per cent loss that we suffer in perishable food. It’s time India graduated from food security to food safety. IN 1985 under the stress of paddy glut in Punjab markets and the Central government dragging its feet due to bulging food stocks with them, the Punjab government set up an expert committee for suggesting measures that would resolve the problems of market clearance for the rice crop in the state. The committee after extensive consultations with professionals in the related fields, informed farmers and other stake-holders submitted its report well in time before the paddy plantation season in 1986. However, as was expected, due the change in the governance scenario and severe droughts for four consecutive years, the report gathered dust on the shelves of the administration. This report was prepared with a long-term vision projected over a period of next five decades, but unfortunately the myopic vision of our political administration could not see beyond their nose. Once again from 1991-92 onwards the food stock started building up and by the end of the decade, the foodgrain stocks reached the unmanageable level of more than 65 million tonnes. The country, as a consequence, suffered huge losses due to spoilage as well as on exports. Quite a few export consignments got rejected and most of the stocks were exported at below BPL prices. Yearly exports amounted to between six and seven million tonnes of foodgrains. In five years, preceding September 2005, 35 million tonnes of foodgrains were exported, of which 23 million tonnes were rice and 12 million tonnes wheat. Surprisingly, while the government had exported 5 million tonnes of rice and about a million tonnes of wheat in the year 2005, by end of that year, the Ministry of Food again started crying shortages. Next year India imported five million tonnes of wheat at very high prices, which it did not need to. Wheat was not available in the international market; otherwise the country would have imported more next year. Since then food stocks have been continuously building up and have again reached unmanageable levels leading to huge wastages and losses. Apprehending the impending dire situation, the Punjab government in 2002 again appointed an expert committee for suggesting measures to resolve the problem. The committee comprising experts, informed farmers, grain handlers and agro-industrialists, after consulting scores of stake-holders, submitted its report in June 2002. The main thrust of the report was on (1) rationalising the water and electric power subsidies for tube-wells so that subsidies are focused to reach the ones who really deserved, (2) providing compensation to the farmers for the replacement of at least one million hectare of land from under rice to pulses and oilseeds crops. At that time while rice and wheat were exported at a huge loss, oils, oilseeds and pulses were being imported costing more than Rs 14,000 crore every year. The subsidy to the farmers for the purpose was costing only Rs1600 crore, which could reduce the production of about 4 million tonnes of rice from one million hectare and considerably release pressure on imports of oilseeds and pulses. Major benefit would have been on correcting the underground water balance of the state because the carrying capacity of water resources in Punjab was not for more than 1.5 million hectare of the rice crop. Punjab at that time was growing rice on 2.6 million hectare of its land. The proposal was agreed to by the Central Ministry of Food as well as the Ministry of Finance, and was sent to the Ministry of Agriculture for further action, but the case was lost due to the indifference, rather hostile attitude, of the Punjab bureaucracy and lack of political process on the part of the state government. The shocking aspect was that in spite of repeated requests by the committee, the report so laboriously prepared was never discussed at any forum of the government. Twice the Chief Minister promised to discuss that in the Council of Ministers, but it was never to be. Now it seems the Punjab government has again woken up from its usual slumber to the ground realities of the situation and the Vice-Chairman of the Planning Commission has agreed to help the state, by setting up a committee headed by an expatriate expert. The intension is no doubt at its right place, yet one wonders what would a foreign expert do? There are no better experts on the subject in the world than the Punjab scientists and agricultural development policy experts in the country itself. There is a top-ranking agricultural university in the state that has nationally and internationally awarded scientists and ranking development policy experts. Working in the Food and Agriculture Organisation, the Economic Commission in West Asia, the World Bank and other international organisations, I have not found anywhere agricultural experts better than Indians. Once, the Chinese government requested the FAO to provide them with one top-ranking agricultural planning expert from the world over for one-day single expert consultation with the concerned agricultural policy makers and planners of their country. FAO sent 16 names from different developed and developing countries. The Chinese government selected the Indian expert out of them. In this scenario, the Planning Commission seems to be grossly under-valuing the expertise available in India. Punjab does not need to seek expertise from outside and waste precious resources. It would amount to manifestation of slavish mentality in seeking advice from the place(s), where it does not exist. Decision-makers in the country need to realise that white skin is not necessarily superior to the brown one! It is not that the problems of the agriculture sector and those of farmers are not known and that their solutions are not there. What is lacking in the state is the political will to take right and hard decisions. It is well known that the underground water balance of the state is in the negative and is continuously deteriorating, mainly because the state is growing at least one million hectares of paddy in excess of the carrying capacity of its water resources. The alternative crops that can be grown on a large scale do not have economic advantages over the paddy crop under the present level of technology and availability of free electric power. In the interest of adjusting the production pattern to the need-based consumption pattern of the country, the Punjab farmers would need to be compensated for shifting the substantial area from under rice crop to other crops, specialty the oilseeds and pulses. Without rationalising the electric power subsidy and right-pricing of water and power supply to the farm sector, the mantra of crop diversification in Punjab would remain no more than a pipe dream. Yet, there is a crying need for diversification in the cropping pattern of the state. More so is the need for diversification of the total agricultural production pattern, including animal husbandry and other allied activities in the sector. Still more important is the need for diversification of the rural economy for providing gainful employment to the rural youth and thereby weaning them away from drug addiction and petty crimes that are plaguing the state. The failure of diversification in the agricultural production pattern of the state is not the technology or advisory failure; it is primarily due to the policy paralysis and vote bank political dispensations that have sucked out the will to take hard decisions. The writer, a former Vice-Chancellor of Punjabi University, Patiala, is a well-known agricultural economist. I vividly recall an event of 1966 when I was studying in class 5 in the Oriental Academy, Afghan Mohalla, near Kacchi Chhawni, Jammu city. Ved Kumar was the owner and principal of the school. He had a pleasing personality and was a very good human being. He never believed in punishing students. The first thing each one of us did was to go to his office and wish him good morning. His office was just opposite the school’s main entrance gate. The characteristic feature of his office was a large-sized beautiful painting of Saraswati, the Goddess of knowledge and wisdom. This painting always hanged on the wall behind the chair of the principal. I have not seen such a beautiful painting till date. It looked directly into your eyes, though you may be standing in any direction in the office of the principal. It was after many years that an art gallery came up in Jammu city and was named after Sir Baru and his popular paintings were displayed there. I realised how exalted the status of a humble drawing teacher was. An impression of this beautiful painting has remained alive in my mind ever since. I can't forget the deep and serene effect this most exquisite paining had on my thoughts and personality. I am sure this must have influenced hundreds of students passing out of our school. After many long years I happened to visit the principal's office of a private medical college in Maharashtra seeking admission for my elder son. The most striking things in the office were two currency-counting machines on one side of the chair of the principal. What struck me immediately was how times had changed. And what type of a value system our young doctors will imbibe if the principal's office itself indicates that making money is all that matters, and not the acquisition of knowledge, wisdom, compassion and humility, as it was during our college days. Private medical institutes are being run for commercial interests. All of us know how much charity work is being done by so-called charitable medical centres. And if parents spend a fortune on their children’s medical education how can today’s society expect values like compassion to be imbibed by those coming out of the portals of private medical institutions? The most likely consequence of the security transition is a protracted conflict between the government of Afghanistan and the Taliban that continues long after coalition forces have ceased active combat operations. These relatively low, but still significant, levels of violence would tax Afghan national security forces, distract the central and provincial governments, threaten the security of the average Afghan, and generally retard Afghan stabilization and reconstruction. While such problems would be serious—though perhaps manageable for Kabul—they would by no means be favorable to Pakistan. A continuing insurgency in Afghanistan will further inflame passions in Pakistan’s own tribal areas and, given the links between the Afghan and Pakistani Taliban, will intensify the threats to Pakistan’s own internal stability at a time when the country’s economic condition remains parlous and its relations with the West precarious. Most problematically, this outcome would deepen the estrangement between Afghanistan and Pakistan, induce Kabul to be even less accommodating of Islamabad’s concerns, and push Afghanistan into a tighter embrace of Pakistan’s rivals. The more serious, though still middling, outcome of the security transition could be a de facto partition of Afghanistan arising from a steady increase in Taliban control that is limited to the Pashtun-majority areas in the southern and eastern provinces. Beyond undermining Kabul’s effort to preserve a unified Afghan state, this consequence would put at risk the international community’s contributions toward reconstruction in Afghanistan. If Islamabad is satisfied by such a result, it should think again. Although the Taliban’s reoccupation of its heartland might appear to produce a barrier region controlled by Islamabad’s proxies, its worst consequences would not be limited to the inevitable meltdown in Afghanistan-Pakistan relations. Rather, the chief concern is the chaos that would ensue from Kabul’s military efforts (almost certainly aided by Pakistan’s regional rivals) to regain control of these territories—a chaos that would inescapably bleed into Pakistan’s frontier regions. Even if Afghanistan were to eventually fail in these operations, the outcome would be deadly for Pakistan. Any Taliban control of southern and eastern Afghanistan would lay the geographic and demographic foundations for resuscitating the old Pashtun yearnings for a separate state, a “Pashtunistan” that would threaten the integrity of Pakistan. Given the current resentment of the Taliban leadership toward its Pakistani protectors, Rawalpindi should not to be consoled by the prospect of a Pashtun buffer along Pakistan’s western borders. The last and most dangerous potential outcome of the security transition in Afghanistan would be the progressive Taliban takeover of the south and east en route to a larger attempt to control all of Afghanistan. This would be a replay of the tragic events Afghans faced between 1994 and 2001, and would plunge the country into a Hobbesian civil war. All Afghan minorities as well as Pakistan’s larger neighbours would be implicated in a cauldron intended to prevent Islamabad from securing its desired “strategic depth” at their expense. A cataclysmic conflict of this sort would be the worst kind of disaster for Pakistan. It would not just provoke major refugee flows that would further undermine Pakistan’s difficult economic condition. It would also integrate the violence and instability currently persisting along Pakistan’s western frontier into a vast hinterland that opens up even greater opportunities for violent blowback into Pakistan itself. The disorder that such a scenario portends would not only put paid to any Pakistani dreams of “strategic depth”—assuming this concept was sensible to begin with—but it would end up embroiling Pakistan in an open-ended proxy war with every one of its neighbours. None of the plausible outcomes of the security transition advances Pakistan’s goal of creating a stable Afghanistan that would be sensitive to Islamabad’s core security concerns. Without doubt, Pakistan deserves secure borders and peaceful frontiers. Yet its own strategies—supporting insurgency and terrorism against its neighbours—have undermined its objectives. If Pakistan’s continuing behaviour is any indication, it does not yet appear to have grasped this fact. An unhappy ending to the security transition is practically guaranteed by Islamabad’s unwillingness to press the Afghan Taliban’s Quetta Shura to pursue reconciliation with Kabul and its reluctance to even call publicly upon the Taliban leadership to seek peace. On top of that is Pakistan’s continued reticence to clarify its preferred outcomes from the reconciliation process and its unproductive haggling over transit compensation for NATO shipments into Afghanistan. None of this convinces Afghanistan and the wider region that Pakistan means well. It may be true that Kabul will suffer most of all from Pakistan’s actions. But the generals in Rawalpindi ought to remember that their country too is facing strategic defeat if the international community fails in Afghanistan. Pakistan’s military and intelligence services in Rawalpindi are betting on groups and individuals that most Afghans, Washington, and other Afghan stakeholders will find unacceptable. Washington, NATO and India are investing in the Afghan National Army and in a government that can prevent the recapture of Kabul by Taliban fighters. Rawalpindi is likely to oppose a future Afghan government that is friendlier to India than to Pakistan. The tactics employed by Rawalpindi increase Pakistan’s continued isolation and decline. 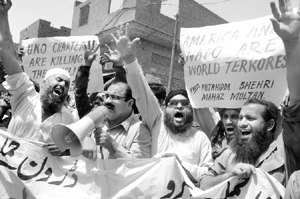 The tactics employed by Washington increase the likelihood of its estrangement with Pakistan. As long as current policies remain fixed, new points of contention seem inevitable between Pakistan, its neighbours, and the US. Rawalpindi is also repeating painful errors. In seeking to secure a friendly government on its western border, Pakistan’s fortunes have plummeted in every way – economically, internally, and externally. The problem lies not with seeking strong ties with Afghanistan, but with the means chosen to achieve this objective. Rawalpindi has good reasons to seek a friendly neighbour to the west, especially as ties with India remain problematic, and while Iran might someday seek to exploit Pakistan’s religious divisions. Pakistan would face intolerable security challenges if Afghanistan, Iran, India and the US were all hostile to Pakistan. No other country, besides Iraq, has suffered more incidents of mass casualty attacks over the past five years than Pakistan. These incidents could grow exponentially if tables were turned, and if Pakistan found itself on the receiving end of destabilisation efforts originating from Afghanistan and India. Much grief has come to Pakistan from the assumption that a friendly neighbour is required in the east but can never be found in the west. Some in India no doubt harbour the desire to use Afghanistan as a springboard to cause Pakistan’s demise, but sensible leaders in New Delhi have reasonably concluded that Pakistan’s demise would impair Indian security and imperil its economic growth. The advent of nuclear weapons on the subcontinent has served to reinforce the territorial status quo. The threat of clashes between India and Pakistan remains, triggered only by spectacular acts of violence on Indian soil that originate from Pakistan – acts that Rawalpindi is either incapable or unwilling to prevent. The writer is a co-founder of Stimson. By arrangement with Dawn, Islamabad.